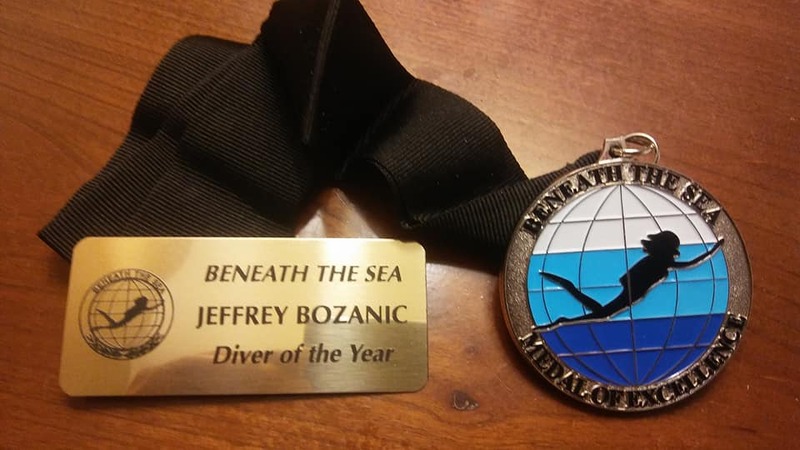 On Saturday 24 March 2018 rebreather author Jeff Bozanic received the 'Beneath The Sea, Diver of the Year (Science)' award. "First, I would like to thank the Board and officers of Beneath the Sea. 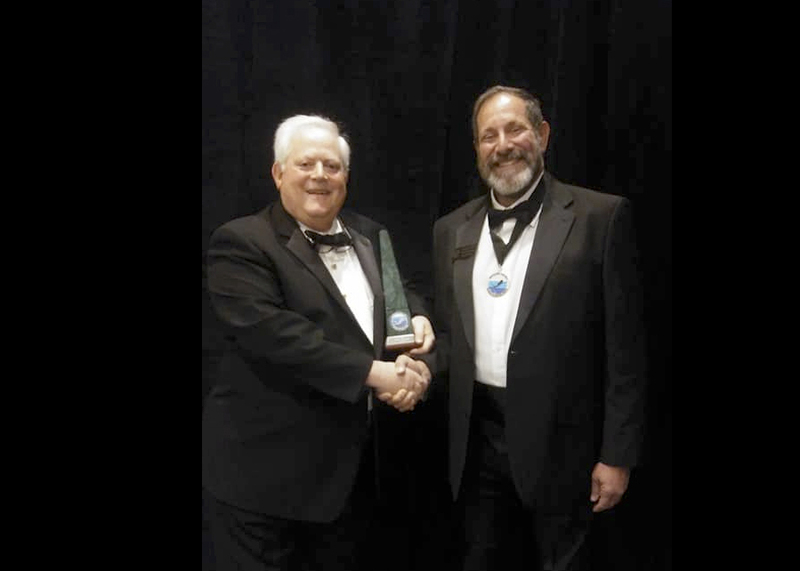 It is humbling to join the ranks of the giants in our industry who have previously been honored with the Diver of the Year award. I feel as though I am joining an elite fraternity, including those who for decades I have viewed as mentors and role models. I have been fortunate to have been able to explore. I have been to all parts of the planet, been diving in all of its oceans and nearly all of its seas, and many of its major inland bodies of water. I have explored and mapped unknown cave systems, descended beyond established acceptable depths, visited remote rarely visited locations to collect data and conduct research. I have seen fabulous places that most people only get to read about. It is hard to express how deeply I feel just how lucky I have been. Many, many people helped me get where I am. Early on, mentors John Reseck, Jr. and John Wozny took me under their wings, preparing me to become a NAUI instructor. My cave diving partners Dennis Williams, Jill Yager, and Gene Melton trained me in cave diving, and shared decades of joint efforts in mapping and collecting unknown creatures from new caves around the globe. Many supported us throughout these and subsequent journeys, private individuals like Bill Horn in Cozumel, and companies like Yellow Springs Instruments, Dive Rite, OMS, Sherwood, Weezle, and Otter Drysuits, providing some of the tools we needed to pursue our goal of seeking new knowledge. Along the way I have been fortunate to work with other dedicated and committed folks traveling on parallel paths. Some were fellow scientific divers, like John Heine, Richard Pyle, Dave Pence, Derek Smith, and Gregg Stanton. Others I worked with to promote dive safety; Glen Egstrom, Lee Somers, Mike Emmerman, Karl Huggins, Bernie Chowdhury, and Butch Hendricks. And others I think of as industry ambassadors, like Bill Hamilton, Dan Orr, and Tom Ingram. I have learned from and grown with all of them, and think of them as friends. There have many, many people I have not named… it doesn’t mean that I think any less of them, or that their efforts and my relationship with them is any less important. It is just that we all live in a truly global community, a wide and diverse group that that has a single overriding, unifying trait… our love of the ocean, and our fragile ecosystem. There are far too many who have influenced me to name everyone. But the reality is our time has passed. It has been exciting, it has been worthwhile… but it is time to pass the torch. New frontiers await. We explore not because we want to, but because we HAVE to! It is in our genes… and is likely to save our species. We need to push new exploration; new methods, innovations, frontiers… both below the surface, and extending all the way to space. We need to help and celebrate the new explorers, the next generation; young divers like Briana Darcy and Taylor Fuchs. Probably the earliest group to recognize this was the Our World Underwater Scholarship Society (OWUSS) with their Rolex supported scholarships and mentoring programs. But many other groups have followed: Beneath the Sea (BTS), Women Divers Hall of Fame (WDHOF), Academy of Underwater Arts & Sciences (AUAS), and the American Academy of Underwater Sciences (AAUS), to name but a few. And the individuals who strive so hard and donate so much to encourage our young rising stars; Rosemary Kurtti, Jeanne Sleeper, Robin Parish, Dave Conlin, Maureen Sweeney, Jayne Jenkins, and hundreds of others. But these groups, these individuals, they cannot continue to carry the load for the entire community. The responsibility for helping the next generation belongs to all of us. Please step forward and take an active role in educating and developing their skills, fanning their passions, and providing them opportunity to stretch their wings and fins. We are a global community, and we will all benefit from their efforts as they evolve and become the individuals who stand before this same dais accepting the same award I am here to receive tonight. Welcome them!